JUSTICE LEAGUE: NO JUSTICE #4 Written by Scott Snyder, Joshua Williamson, James Tynion IV Art by Francis Manapul, Hi-Fi, Andworld Design Edited by Andrea Shea, Rebecca Taylor, Marie Javins Published by DC Comics Release Date: May 30, 2018 I don’t think anyone understands the DC Universe better than Scott Snyder, Joshua Williamson, and James Tynion IV. Geoff Johns may oversee the universe, Jim Lee may build the universe, but it’s the triumvirate behind No Justice who understand the universe. 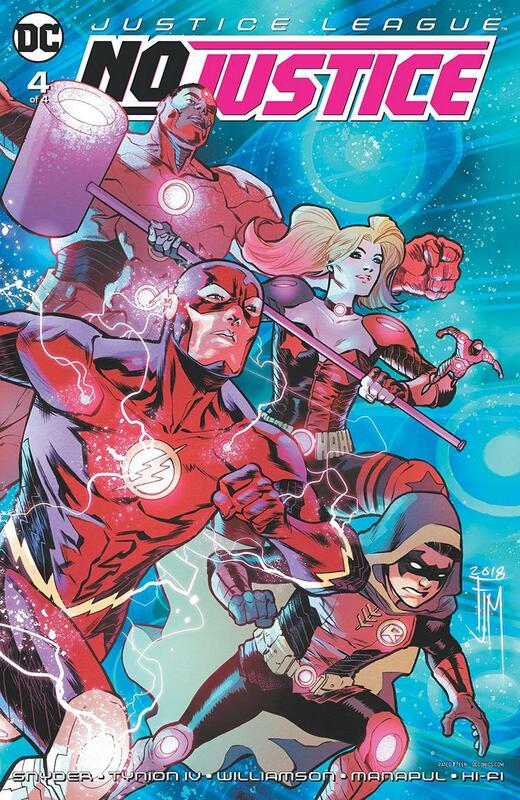 They, more than any other writers on the DC roster, understand that the DC universe isn’t about the plot contrivances, the crises’, or the continuity; it’s about the heroes and villains, the ideals and themes they represent, and their promise that you can rise about the malice that the world will bring to your doorstep. And they proves it with the last-installment of Justice League: No Justice. In a follow-up to Snyder’s instant classic, Dark Nights: Metal, No Justice sees Brainiac pluck a wide assortment of heroes and villains from Earth and splits them into strange, seemingly random teams with the sole purpose of stopping the Omega Titans. The Omega Titans are giant, Galactus-ish, space monsters that have come to the universe via a break in the source wall that happened during Dark Knights: Metal and just like Galactus, they’re out to eat some planets. All that’s just plot contrivance and backdrop though, what is truly remarkable about the series is the teams, their interactions, and what they represent. Snyder and company theorize that the DC Universe is made up of four forces: Entropy, Wisdom, Wonder, and Mystery and assigns characters to respective teams based off of these heading to astounding results. Within issue 4 alone, we see unexpected leaders emerge and new character realizations based of the motley juxtapositions in the context of a high stakes conflict that serves as both sequel to what came before and prelude to establishing a new status-quo for the DC Universe at large. But Snyder’s, Tynion’s, and Williamson’s words are but words were it not for Francis Manapul efforts with the art. He, once again, proves he is one of the comic industry’s underrated virtuoso in how is capable of keeping up with the frantic pace of the script. Whether it was the ominous arrival of the Omega Titans into Earth’s atmosphere, the triumphant arrival of Batman and Team Entropy, or Green Arrow’s simple look of burdened purpose during his last conversation with Martian Manhunter, Manapul is able to emote the gravity of the story excellently. His use of splash-pages is also most impressive. Remember, there are about 40 characters in the story running around the universe trying to stop giant space monsters. There’s a lot to pack in and Manapul accomplishes it without making the book feel overstuffed. Justice League: No Justice #4 is a perfect Justice League story. In one issue, Snyder, Williamson, and Tynion IV deconstruct and distill the DC Universe as a whole to preach to new-comers and veteran readers alike the wonders of its characters while at the same time setting DC’s entire line of comics for what’s to come. It’s can’t miss issue for any fan of superhero comics.